Schulman, Daniel. Sons of Wichita : how the Koch brothers became America’s most powerful and private dynasty. Grand Central Publishing, 2014. The October 2014 issue of Harper’s magazine features an article, PBS Self-Destructs, that begins with a protest at WGBH in Boston, to force the station to dislodge David Koch from the station’s board of trustees. Protesters claim that the oil tycoon’s new strategy for PBS is to destroy it from within, and they condemn the business practices of Koch Industries in general. The protest is given a short mention in the final pages of a remarkable new book, Sons of Wichita, by journalist Daniel Schulman. This story about the Koch family’s power, wealth and abundant conflicts begins in Kansas where Fred Koch begins life in modest circumstances, starts a refinery business and celebrates his 30th birthday a wealthy man. A zealous anticommunist, he helps found the John Birch Society. He teaches his four sons to be tough and competitive, to work hard and to distrust government. Two of Fred’s sons, Charles and David, join the family business and under their leadership, Koch Industries grows into the second largest private corporation in the US. Schulman paints a picture of Koch Industries as an unethical company with a profit obsessed corporate culture. In a two year period in the late 90’s Koch Industries are taken to court four times– for duping family members on the sale of their company holdings; for pipeline violations that caused two teenagers to be burned to death; for fraud when taking oil from native American lands; and for covering up the environmental consequences of leaky pipelines and storage tanks. Yet the book is more about the dysfunctional Koch family than about the company. In two of the four lawsuits, the Koch brothers support the plaintiffs as well as the defense as the brothers battle bitterly over the empire their father left to them. Co-founders of the libertarian CATO Institute and drivers of the Tea Party movement, the Koch brothers are sometimes accused of orchestrating a secretive campaign of self-interested political reforms. But to Schulman, it is more creed than greed. Koch Industries CEO Charles Koch believes that all functions of society should be privately funded and he donates heavily to causes that advance the doctrine of libertarianism. To shape public opinion, Koch hopes to reach the intellectual class through educational institutions, research funding, and yes, even public television. Readers of this book will find themselves both engaged and enraged about the Koch family. The battles and feuds among the four brothers last 20 years, vicious attacks in courtrooms and boardrooms, over issues at the company as well as their inheritance. Shulman’s illuminating portraits of Koch family members bring a human dimension to the conflicts. Recommended reading for anyone who enjoys business, politics or Game of Thrones. Gallo, Carmine. Talk like TED : the 9 public speaking secrets of the world’s top minds. St. Martin’s Press, 2014. McGowan, Bill. Pitch perfect : how to say it right the first time, every time. Harper Business, 2014. In July, two Ford Library staff members attended the Advanced Communications Workshop taught by Dorie Clark, Fuqua adjunct professor, former presidential campaign spokesperson and author of the book, Reinventing You, about developing a personal brand. Prof. Clark also teaches a popular course in Fuqua’s Executive Education program, Great Leadership Requires Great Communication. To influence, inspire and persuade others, corporate executives and government leaders need to communicate clearly and confidently with diverse constituencies both inside and outside their organizations. Two new books in the Ford Library also explain how to communicate ideas so they are heard and understood. Talk Like TED is for speakers who want to deliver presentations with more confidence and authority. 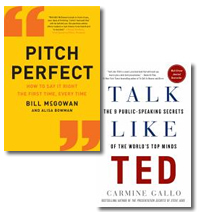 Author Carmine Gallo analyzes more than 500 TED presentations and distills nine common elements from the most popular ones. Like Dale Carnegie 100 years ago, Gallo recommends that speakers keep their presentations short and tell stories to connect emotionally with the listener. But he also adds more modern techniques such as the use of humor and novelty. He advises speakers to have passion and also to be authentic. Gallo is also the author of the bestselling book, Presentation Secrets of Steve Jobs. Communications coach Bill McGowan helps clients, executives and celebrities, decide what to say and how to say it. In his new book, Pitch Perfect, he condenses what he has taught in 4000 coaching sessions into a simple set of 7 principles for handling a variety of personal and professional communication scenarios. To get attention, McGowan recommends starting with the best material, and to hold attention, he recommends preparing a brief but rich message. He underscores the importance of conveying certainty with words, posture, eye contact and tone of voice. He shows how to use visual images to illustrate a story. His principles work for media interviews, internal meetings, interviews and most other business communication situations. Both of these books are informative and engaging, and they are recommended for professionals who communicate their ideas at work. I grew up in Thomasville, NC, and if your first thought was furniture, you are correct. In fact, Thomasville was a two industry town. In a state known for three products – tobacco, textiles, and furniture – we had numerous knitting mills and we had Thomasville Furniture. In the 1960s, jobs were plentiful in Thomasville. We had everything a small town could want or need. Belks department store stocked our school clothes, the Tasty Bakery baked our birthday cakes, and The Big 3 auto dealerships sold us our cars. Thomasville Furniture was to thank for much of this largesse. Then it slipped away. Textiles left in the 80s, but furniture remained. Then NAFTA struck, and slowly those companies, who had been so loyal to their employees, moved to places not named after the town where they began. Finally, the entry of China into the WTO was the final blow to my hometown. As I write this, Thomasville Furniture is out of business, and the grand showroom, headquarters, and giant Plant C are on the auction block, unlikely to be sold to another big employer. 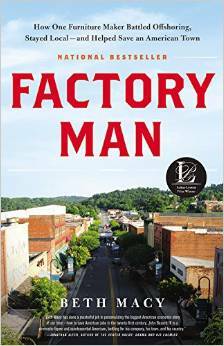 Beth Macy, author of Factory Man, details Bassett VA, a company town less than 75 miles from Thomasville. Both the company and the town are named for the J.D. Bassett family. Mr. J.D. got his start in lumber before luring away the furniture industry from Michigan. Using the local resources, abundant forests and subsistence farmers, he not only made a less expensive product but also produced it faster than any of his competitors. Along the way, he raised the standard of living from poverty to middle class for his workers, while reminding his family it was these people who helped make their fortune. Macy details Mr. J.D. and his heirs in this story of what community meant to its founder and how that was slowly dismantled by competition and greed, so, like Thomasville NC, furniture is no longer crafted in Bassett. From the ruins, though, we meet JDIII, or John Bassett III. Like his grandfather, JDIII believed in buying the best machinery, hiring the best people, and working them hard. 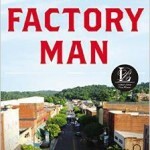 He was eventually pushed out of Bassett Industries and started his own furniture company, Vaughan-Bassett, in nearby Galax, where he learned that no matter how efficient his production lines were, he couldn’t beat the prices offered by offshore competition dumping bedroom suites and dining room sets onto the US market. Against his own Bassett relatives, friends, and industry insiders, JDIII charged the US International Trade Commission with shirking its responsibilities. Ms. Macy works her way through the D.C. law firms and courts to show the reader the machinations of trade law enforcement. We see retailers wanting nothing more than the lowest price. We see American furniture executives wanting nothing more than their companies’ survival, regardless where the furniture is made. And incredibly, we see a glimmer of hope for US manufactured products.